【5 light modes】High / Medium / Low / Strobe / SOS, with ON OFF button, easy to operate. 【Adjustable focus】Zoom lens allows you to easily switch from a narrow beam to widespread coverage. 【Anti-skip and waterproof design】Producing super bright light perfect for hunting, cycling, climbing, camping and outdoor activity etc. 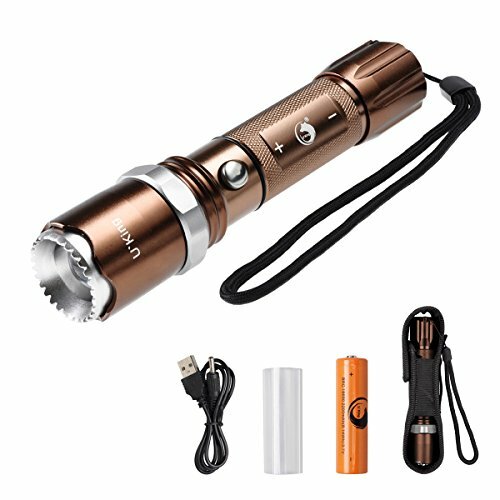 【Convenient】Including a bright flashlight, a 18650 battery, a 18650 sleeve, a holster and a USB charging cable, convenient to use and charge, you can take it with you wherever, whenver.